Hi there, my name is Chris and the first thing I would like to say is thanks for stopping by my website. Of course, you have found this website because you’re on the hunt for a new thermostat, however if you’re expecting a lot of industry terms and technical jargon I’m sorry to disappoint you. You see I’m an average member of the public just like you and the main reason I decided to publish a review website on thermostats is because I was looking for one not so long ago. In fact, it was the first time I had been in this situation and what I thought was going to be a very quick and easy task turned out to be a good many weeks of research. Eventually, I found something that would suit my needs but it occurred to me that I wasn’t the only one who might be having the same problems I did. So, you will find reviews on some models of thermostat that impressed me (and a good many other people), and you will find a few informational pages as well. What I would like you to remember as you browse my website is that I don’t work in the industry so the reviews I have are based on good old fashioned honesty. I have tried to cover all types of thermostat which means you’ll find programmable, non-programmable and wireless. Fingers crossed, you will find one that suits your needs, and you won’t have to go through all the long-winded research I did. Perhaps you already know all about the world of thermostats and you’re just interested to know what models I have here. Or, it could be that you’re not the type to spend a lot of time searching through a website in order to get the information you need? Whatever the reason for jumping straight to this section on my homepage, I completely understand. In fact, it’s people like you I had in mind when I put together this comparison table. In this section you will be able to see the models I have reviewed, which manufacturer they are made by, what type of thermostat it is and how much they cost. If you’re especially interested in the wireless models of thermostat I have for you, feel free to take a look at my wireless comparison page where you will get plenty of in-depth information on all the models I’ve reviewed. Some of you may not be here because you need to buy a thermostat right away, and I can relate to that. After all, you need to have some knowledge of what you’re dealing with before you go ahead and make a purchase. So, just for you I’ve added the following information pages. What I discovered when I was looking for a new thermostat is that it’s not like buying a new electrical appliance for the kitchen. There are all sorts of things to consider like what type of system you’re already running, how many features you need and much more. So, on this page I’ve done my best to cover everything. Saving energy is something pretty much all manufacturers at least place some focus on. After all, they know how costs are rising in this respect and prospective customers are likely to purchase a thermostat that’s going to bring those energy bills down! On this page I explain in a bit more detail how this is done. I suspect a lot of you will be interested in reading this page. I would say there “appears” to be quite a bit of confusion surrounding how you work out if a thermostat is compatible with your current HVAC system. However, the fact is there IS a lot of confusion. Hopefully this page will answer any questions you have. Some of the choices may be obvious, but others may surprise you. Here are the top seven thermostats selected by type of use or type of user. Multiple sensors allow you to control the temperature independently in different rooms using this state-of-the-art thermostat system. It will allow you to control heating systems, cooling systems, humidity control systems and air purifiers from anywhere at any time. Ok, the “learning” way of programming may feel a bit uncomfortable at first, but before you know it you will never want to go back. 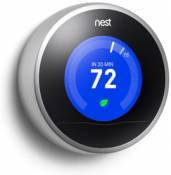 In my opinion you can’t go wrong with the Nest Learning Thermostat. If you want top technology and plenty of features without the hassle, this model is certainly worth a look. Looking for something with Wi-Fi abilities but not willing to pay the high prices associated with top-of-the-line thermostats? This Sensi Smart thermostat features Wi-Fi compatibility, voice command control, pre-programmable settings and a lot of other impressive features and functions. This easy-to-use and incredibly easy-to-install thermostat allows you to manually adjust the temperature or set it to specific levels for specific days and specific times of day. You won’t have to fuss around with intricate settings but will get all the convenience of a programmable thermostat in your home. If you want a very simple, straightforward, easy-to-use thermostat you cannot get much more basic than this Honeywell device. It is built to give you the absolute basic functions of adjustable heating and cooling without all the confusing interfaces involved with programmable options and remote controls. Touch screen technology is just about everywhere these days, and thermostats haven’t been missed. My favorite is the Honeywell RTH8500D 7 Programmable which, as the name suggests, has the option for 7 day programming but it’s also packed with numerous other features. The Lux WIN100 is designed to work with space heaters and portable air conditioning units, something I never knew was possible with outlet thermostats. At last, your portable heating and cooling appliances really don’t need much intervention from you! OK, I’m not going to continue with a whole load more text so I’ll keep this brief. For more reviews you can just browse the categories, for instance the wireless thermostat category. Here you’ll find 5 different models to choose from. On this page, I have given you an insight into the various thermostats that are available on the market. Here you can find out about programmable, non-programmable, wireless, touchscreen and even outlet thermostats. Some of you may be confused about thermostats and how they’re wired, and this video page should clear up any questions you might have. If you are curious to know how you go about installing a thermostat, you can take a look at this video page. You will find one general installation video, one for the Nest and one for the Honeywell Wi-Fi smart. I really hope you enjoy my website. I have done my best to include reviews on thermostats that will suit all sorts of needs. I’ve also included plenty of informational pages so if you prefer you can just use my site to gain more information on the subject in general. All in all, I really hope I make the whole searching for a thermostat “task” a lot easier for you, and that you manage to at last find the unit you’ve been looking for.